Room size: 5m x 11.5m W x D, 2.6m ceiling with exposed wooden cross beams every 60cm, plaster over brick walls, suspended wood floor with Tatami-type throw rugs. The listening space opens into the second storey via a staircase and the kitchen/dining room are behind the main listening chair. The latter is thus positioned in the middle of this open floor plan without the usual nearby back wall. The first thing about SOtM the company from South Korea*—its tag line Ultimate High Performance Audio indicates ambitions— is that name and peculiar spelling. Designer/owner Il-Won Lee explained through May Park, his export sales manager, that it stands for Soul Of the Music. Whilst looking tekkie it's actually poetic. Founded in 2008, SOtM is about computer audio in ways that go deeper than with usual audio firms. Not only do they make add-ons for actual computers like a fan filter [$25] and SATA noise filter [$65], they offer fully optimized USB 2.0 and USB 3.0 computer host cards [$300/$350] with external power inlets to isolate this vital audio link from that so very non-PC very dirty PC power. This takes care of parts of the first 50% of computer audio which nearly all hifi companies neglect altogether [below]. * South Korea has become quite the source for quality hifi products. 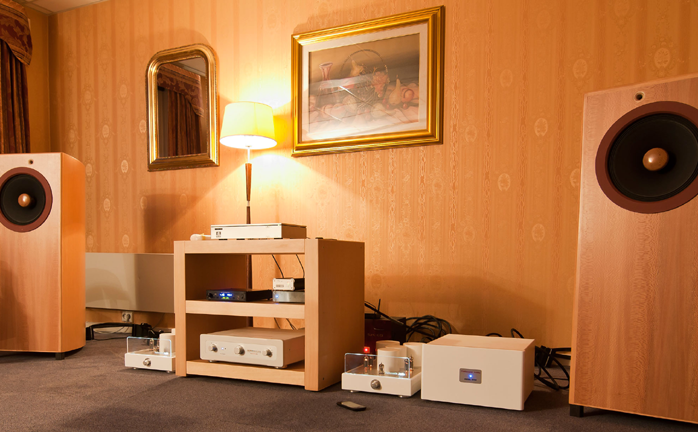 Just think Allnic Audio Labs, April Music, Aura, Bakoon Products, Emillé Labs, SOtM and Widealab. Once we're back outside the computer and in common audiofile gringo land to invoke Frida Kahlo, SOtM not only address the other 50% with the ubiquitous DAC [$2.000] and even a separate server [$2.500 to 2.990] but also with something for that critical link between the two halves I simplistically called inside and outside: an asynchronous USB:S/PDIF XMOS-based bridge with 32kHz to 192kHz sample rate indicators and AES/EBU, Toslink and coaxial outputs; and a matching Bakoon*-style battery supply that power-cycles between two cells for non-stop uninterruptible output. If you shrug shoulders because "my DAC's already got USB", in many instances perfectly sound improvements are to be had from handling this externally. The why and how aren't fully clear. Let's just leave it at firmly stating that numerous colleagues with this and other publications came to the same independent conclusion as of course have many 'civilians' on various forums. * SOtM's May Park: "We know about Bakoon's BPS-02 uninterruptible battery supply. They are another Korean company like us. We already offered our battery pack whilst they were still developing theirs. Perhaps we could call our mBPS-d2s the ancestor or motivator." Bakoon's Soo-In Chae: "Our concept is derived from a lengthy discussion with a very highly regarded Korean engineer who'd developed a similar concept for custom precision industrial measuring gear (measuring aerospace-grade bearing crack tolerances) during the 1990s. In his application various AC power supply designs simply wouldn't match a battery solution. We thus share the patent ownership with his company and unlike SOtM we don't use a digital controller circuit and CPU to eliminate another source of noise." Many even very costly DACs run affordable M2Tech OEM boards based on their hiFace I/II. A good number even run on USB power. Is it really so outrageous to believe that this might not be the very last word in hi-tech? Sonically effective bridging needn't cost silly money. The rightly popular Audiophilleo 2 is $579, Resonessence Labs' Concero $600, April Music's Stello U3 $495, Halide Design's Bridge $395. To quote from my Metrum Hex review for a kind of road map, Adam Mokrzycki organizes the Warsaw Audio Show and also is senior contributor to the Polish Audio magazine. His test of 14 USB bridges netted the following ranking: Matrix 24/96 - 60; TeleVox 24/96 - 65; Hegel HD2 - 65; Musical Fidelity V-Link II - 75; Halide Design The Bridge - 80; M2Tech HiFace Evo - 80; Stello U3 - 85; M2Tech HiFace Evo + Evo Supply - 90; JK SPDIF Mk3 - 90; Audiophilleo 1 - 95; Empirical Audio OffRamp Turbo 5 - 95; dCS U-Clock - 95; M2Tech HiFace Evo + Evo Supply + Evo Clock -100; Scarlatti CD/SACD transport - 100. 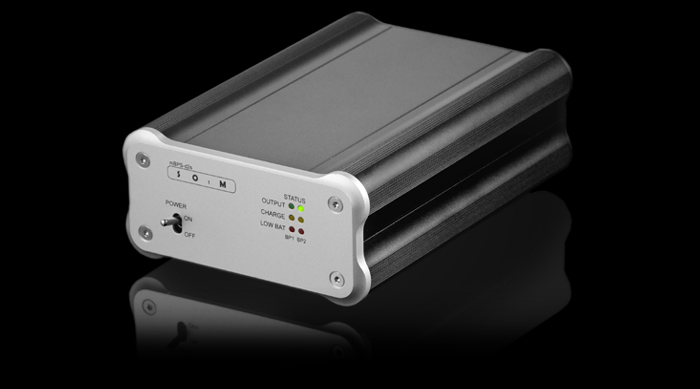 Subsequently Adam reported that with the new Pure Power battery supply, the Audiophilleo became one of the best if not the best S/PDIF converter he knew. While out-costing hiFace & Co., at $450 for the dX-USB HD format converter and $400 for the matching mBPS-d2s battery supply, SOtM joins the not über-expensive league. Their rates are reasonable if their small 105 x 53 x 150mm goods deliver. Where things take a turn into heavier duty is the sCLK-2224 super clock option. That drives the $450 sticker up by a solid $500*. Not only is this claimed to be the ultimate in jitter reduction, it now requires their otherwise optional battery supply. That means a $1.350 proposition in total. And it is this top-dog duo my review reports on. My rationale for this choice was simple. Greed. * That stout sticker also reflects ultra-low-noise regulators, Evox Rifa and PPS film chip capacitors, discrete devices and audio-grade op-amps, with the ULNR circuit SOtM's own. 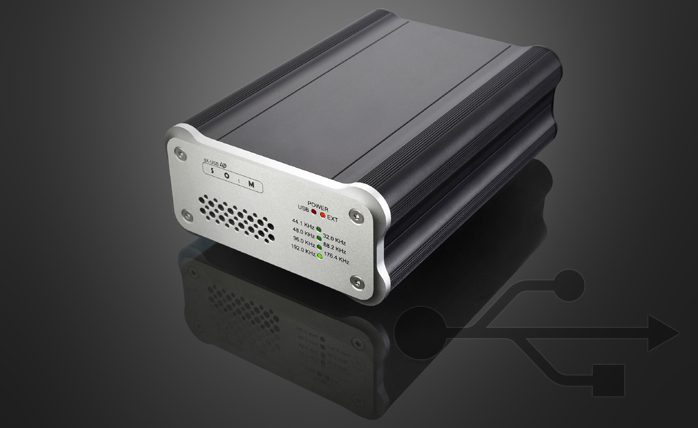 "When you use the dX-USB HD with the sCLK-2224, the dX-USB HD employs the sCLK-2224’s regulation for its first regulation stage. 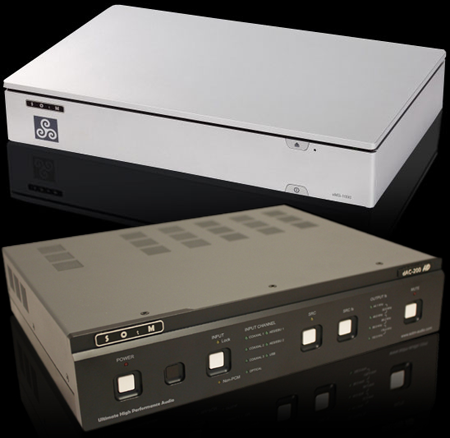 The sCLK-2224 has two clock circuits for the audio- and video-related sampling frequencies - a 22.5792MHz clock for 44.1, 88.2 and 176.4kHz, a 24.576MHz clock for 48, 96 and 192KHz. When one clock circuit activates the other automatically shuts down completely. This prevents oscillation, random jitter and eliminates the need for two premium regulator circuits. The sCLK-2224 also includes active power-noise reduction within the clock block to attenuate <10Hz components. This super clock circuit comes standard with our sMS-1000 server and can be optionally fitted also to our dAC-200." On greed. In a previous such comparison I'd found the differences between a Bakoon-powered Audiophilleo 2, Bakoon-powered Concero and the linear powered galvanically isolated—i.e. modified—Cypress Semiconductor-based M2Tech OEM module inside Metrum's Hex to be small. They essentially tracked the changes the operating point control on Nelson Pass' SIT1 monos creates. Think shifts in the distribution and amplitude of 2nd and 3rd-order harmonic content. It manifests as triode/pentode flavors: sweeter, warmer, softer vs. more separated, cooler and crisper. Rather than clear-cut improvement, what one prefers is a function of ancillaries, perhaps even playback material and mood. In short, it's far from decisive. To build into today's assignment at least the potential for a more significant performance delta—the writerly greed factor which wants to talk about more than "couldn't hear no difference"—I decided to be piggish and go whole hog. Oink? Those similarly porcine about 'everything'—super clock, endless battery power, premium regulators, D/A conversion, volume control, analog RCA/XLR i/o ports—might look to SOtM's forthcoming 32-bit/192kHz sDP-1000 DAC/preamp with OLED display, remote control, volume from +10dB ~ -60dB in 0.5dB steps and selectable upsampling expected to sell for below $3.000. Those starting out with the basic SOtM dX-USB HD wishing to subsequently upgrade with the super clock board can see a few installation photos here.